Welcome to the latest installment in my “Thrift the Look” series! As you might recall, this is a blog post where I take an inspiration photo from a magazine and recreate it as best I can using thrift store treasures and minimal DIY. And this time around, the style/theme is Lake House Decor / Lake house decorating ideas! In this post, I’ll take you through my thrifting strategy, incorporating tips and ideas that I hope you can use in your own secondhand shopping adventures. I’ll also tell you about any “low effort” upcycling projects I did as I recreated the inspiration photo. This post contains affiliate links for your crafting convenience. My own childhood memories of Lake Michigan (growing up outside of Chicago and spending summers in St. Joseph, Michigan) guided me towards the lighthouse lamp and all things “duck”. Now, when it came to the framed fish in the lake house decor inspiration photo, I had a different take. First, I found this vintage wooden paper tray, and as soon as I saw it, I thought it could become a makeshift shadowbox. Then…I found this ceramic fish! I could tell it was small enough to fit inside the paper tray (no need to measure) so I snapped it up, too. 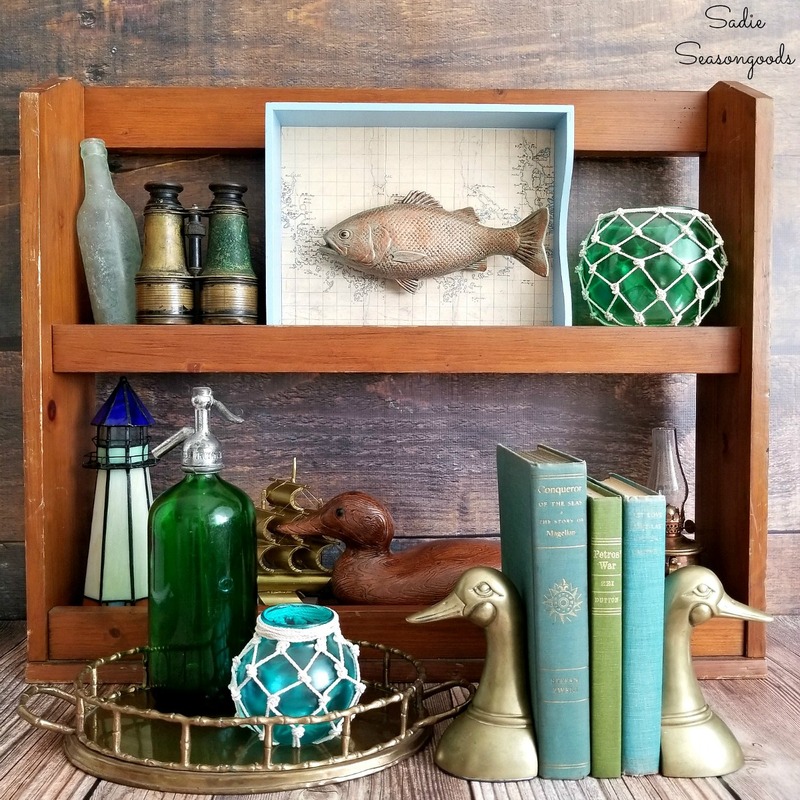 To complete my fishing decor, I: (1) spray painted the entire thing white; (2) painted the edges pale blue; (3) decoupaged the flat interior with vintage nautical charts; and (4) glued my fish inside! Why take step #1 (white spray paint)? So that the flat surface inside was white, which allowed the decoupaged nautical charts to really pop! Next, I found this bamboo sailing ship- not exactly a sailboat and CERTAINLY not brass. But, it was inexpensive, so I grabbed it nonetheless. All I did was spray paint it gold, then touched up with this brushed-on paint to give the finish more depth and nuances, like real vintage brass. This would work SO MUCH BETTER for the lake house decor / lake decor style that I was going for. And last but not least, the glass fishing floats in the inspiration photo! You might actually recognize those as a blog post I recently re-published– they’re easy to make using thrifted glass bowls and vases. So…right in line with the whole “Thrift the Look” theme, eh? Ready to see all of my lake house decor assembled in a recreated photo?? When I think of “lake house decor”, I immediately think of the famous St. Joseph, Michigan lighthouse and pier. What comes to your mind when you think of a lake house? Use childhood memories to be your shopping compass. Some of the prettiest vintage books are cloaked in crumbling dust jackets. Don’t forget to peek behind the jacket to see if candy-colored linen binding is hiding underneath- I do it all the time! Phone a friend! Create thrifting scavenger hunts for each other when you’re looking for something specific; ESPECIALLY if they live in different climates or geographic regions that may be more conducive to styles like lake decor / lake house decor. I hope you enjoyed this version of Thrift the Look as much as I did! I love the challenge of recreating a certain decor style, and now I’ve done French Farmhouse Kitchen and Lake House Decor. Which style should I do next? What a great series! I love your interpretation of the photos. 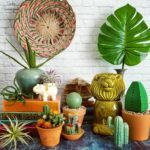 i’m curious, you create a lot of upcycled decor — do you ever resell items at markets or anything like that? Thanks, Rebecca! It’s a constant struggle- some projects I keep and we use around our home. But others get sold- I used to run an Etsy shop, but shuttered it a few months ago. Now, if a reader is really interested in something, I just do a private sale through PayPal. Other projects get broken apart if I can reuse pieces of them, and then the rest either go to friends or donated. Loved this post! My husband and I recently purchased a lake cottage and I’ve been decorating it almost 90% with thrift store finds (and new beds of course!). So much fun. 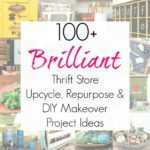 Thanks for encouraging people to be thrifters! Ohhh, that’s awesome! I’m a thrift store attic and LOVE to encourage people to do more secondhand shopping. What a fun exercise in decorating! It would be a blast to look for just the right items to create a look. Love your creativity in making found objects fit the look. Now off to check out the others’ projects! It’s SO fun, Cecelia!! So fun, the group is already planning our next one, LOL. You are the master at transforming thrift shop finds into beautiful decor. You found great things to use for this challenge! I love the shadowbox that you created with the fish and tray. Spray painting the ship you found gives it a great updated look. I’m really lusting over your duck bookends. I’d love to use those at my lake house! Thank you so much, Paula! Yes, those brass bookends were a real bonus to find and I’ll probably take them to my in-laws’ cabin in a few weeks, LOL. You all did a terrific job of interpretation and I love that there is nothing “cookie cutter” about it. I love your aesthetic! This turned out so beautifully! I love how you painted the ship to look brass…perfect! And the shadowbox is wonderful! I love the colors and the whole look! This was a lot of fun to participate in! It makes me want to work some alchemy on other pieces, LOL. Thank you! Fabulous! I love where your creative vision took us – the fish tray is awesome, awesome! Painting the ship gold was a brilliant idea (I don’t think I would have figured that out), and the DIY fishing float – WOW! The whole look is perfect with a ton of great tips packed in there. Thank you for sharing so many amazing lake house decor ideas!! I love what you did and love this idea for a party! Thank you!!! It’s crazy how fun it is to go thrifting in order to match a photo or “look”! Your framed fish is GENIUS! I love it so much! This series hits all the sweet spots for me. Thrifting, vintage and it’s a challenge. PLUS I get to work with all you fabulous thrifty dames and that’s icing on the top. Thank you for pulling this all together! I’m so glad that we did it as a group!! And man oh man, I just can’t wait to get started on the next one. “Lake houses” of my childhood were summer camps that did not have decor, just wet towels, life jackets, and sandals strewn all over. I loved your vignette, especially the fish shadowbox. As one who never has vintage nautical charts sitting around, I’d grab a sheet of scrapbook paper! You put your finds together so nicely; you make it look easy; I know it’s not! I’m always blown away at your vision and how you can take one thing and give it an entirely different look or purpose. Creating that shadow box and painting the ship were genius ideas. All of your items are just perfect for the vintage lakehouse look. Thanks for coming up with this fun challenge! Thanks, Angie- already chomping at the bit to get started on the next one! Love all your finds The master bedroom has the lodge/lake house theme so fun to decorate and find cool stuff….once I find some snow shoes, skates and maybe a ski I will be all set for winter The wooden tray came out beautiful! Will do, Sara- thank you! I love the aquas and greens with the brass accents; so pretty. I found a wood file drawer just like yours when I was hunting! Thanks so much for letting us in on this fun adventure; it was such a blast!